Producing partners Nuffield and Curve in association with Lyric Hammersmith bring brand new musical adaptation of Roald Dahl’s FANTASTIC MR FOX to the Alhambra Theatre, Bradford from Wednesday 28 June – Sunday 2 July 2017. A wondercrump treat for the whole family, the show is a playful re-telling of Roald Dahl’s much-loved book; a brilliantly witty tale of the clever Mr Fox outfoxing three greedy farmers, brought to life on stage with live music and songs. Published in 1970, Roald Dahl’s FANTASTIC MR FOX delivers family fun at its finest and remains a firm favourite amongst Roald Dahl fans of all ages. The story of Fantastic Mr Fox and his heroic adventures became a global sensation following the popular success of Wes Anderson’s Oscar-nominated movie version (released in 2009), which starred George Clooney in the title role. 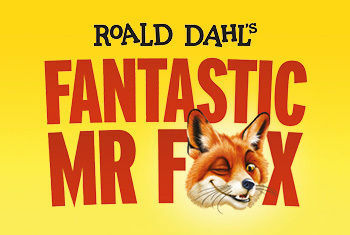 This new musical adaptation of FANTASTIC MR FOX was produced to mark the Roald Dahl 100 celebrations of the world’s number one storyteller in 2016. This new commission brings together a stellar creative team: playwright Sam Holcroft, director Maria Aberg, designer Tom Scutt, composer Arthur Darvill, lyricists Darren Clark, Arthur Darvill, Sam Holcroft and Al Muriel, sound designer Claire Windsor, lighting designer Lee Curran, casting director Annelie Powell and movement director Ayse Tashkiran. Cast includes Greg Barnett as Mr Fox, with Richard Atwill (Rat/Bean), Raphael Bushay (Badger/Boggis), Jade Croot (Kit), Sandy Foster (Rabbit), Lillie Flynn (Mrs Fox), Gruffudd Glyn (Mole/Bunce), Kelly Jackson (Mouse), and Edward Hole and Tanya Shields completing the ensemble, alongside actor-musicians, Patrick Burbridge, Anna Fordham and Richie Hart.